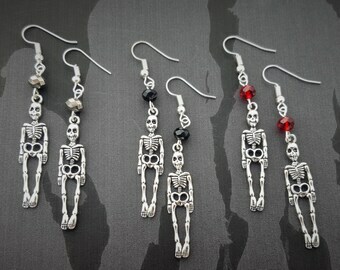 A funky pair of skeleton earrings! The perfect accesorry for halloween or an alternative outfit! 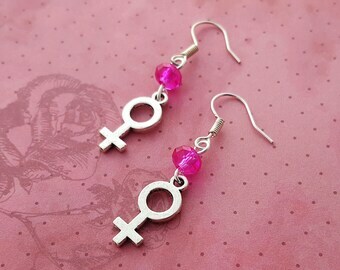 Drop Distance: These earrings have a 2” drop from the lobe to the bottom of the charm. ☆ Clip-On Screwbacks: Silver plated, they pinch shut but then they can be screwed from the back to be of comfortable tightness. They are far more popular with children than other types of clip-ons on the market as they don’t pinch tight if you don’t want them to. 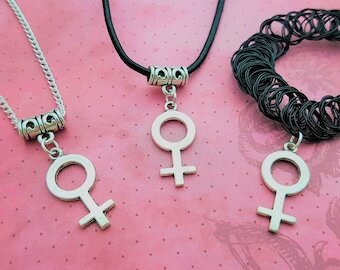 ☆ Posts: Silver plated or Sterling Silver with butterfly backs, they also come with rubber backs just incase you prefer them instead. 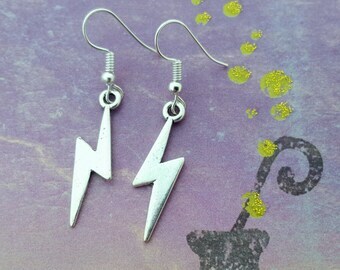 ☆ Hooks: Silver plated or Sterling Silver for an extra cost. They come with rubber backs which are optional to wear. Skeleton Charm: 39x9mm, double sided, Made from Tibetan silver, a zinc alloy that is lead and nickel free. 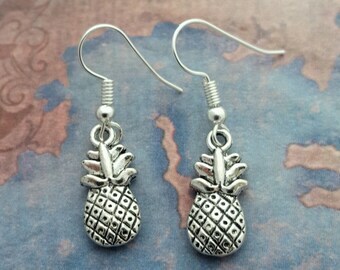 The earrings come in a gift bag, backed on a card and come with care instructions. Note: If you buy them as posts or clip ons they will come in the gift bag without the card to protect them during transit. 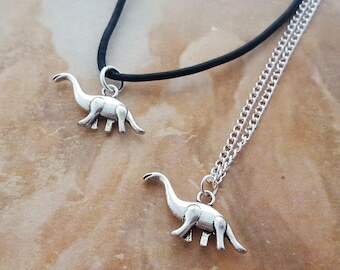 Upgrades available: Sterling Silver upgrade. 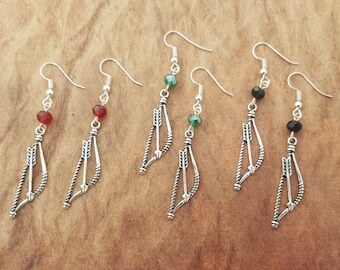 Genuine sterling silver earring hooks or posts for people with sensitive skin. 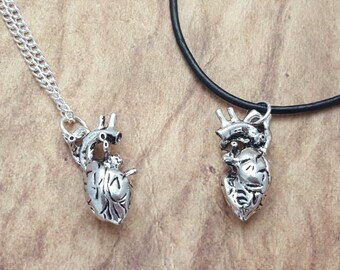 They come with a sticker on them that says Sterling Silver and are stamped 925. 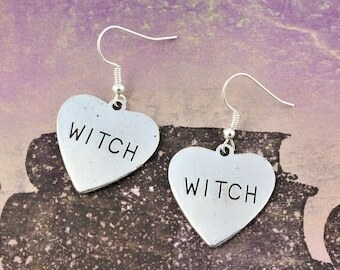 I do my best to acquire these earrings from trusted silver sellers. How to tell genuine sterling silver earring hooks from the fakes: Fake sterling silver earring hooks have the “925” stamp on the broadest part of the hook near the ring at the bottom. The genuine solid sterling silver earrings have the 925 stamp really tiny along the straightest edge of the hooks at the back. I only use the genuine ones to make sure you are paying for quality. 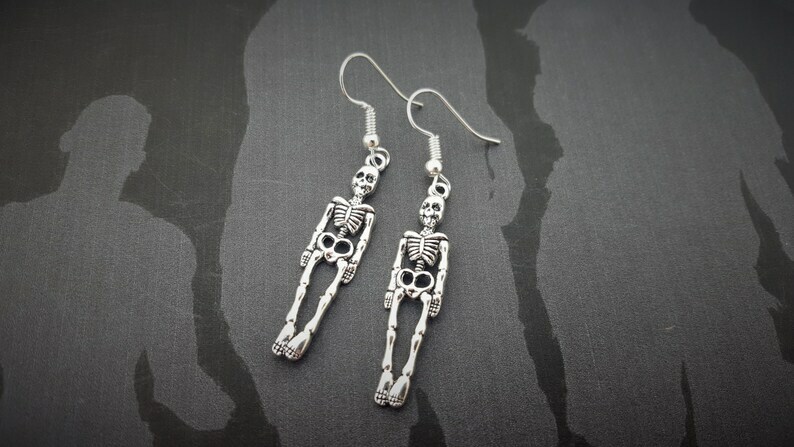 These earrings are perfect for skeleton halloween costumes.